Symphony NH is pleased to welcome Ryo Usami and Janny Joo to the orchestra. These exceptional musicians will join the violin section of the orchestra starting in the 2017-18 season. Ryo Usami joins Symphony NH as the new Principal Second Violin and is looking forward to working alongside talented musicians to bring his “passion and emotion” (Art and Review Quarterly) to SNH. At the age of eight, Mr. Usami began studying violin and has continued throughout his life. He attended the Peabody Conservatory where he received his Bachelors of Music degree under the instruction of Violaine Melancon, a founding member of the Naumburg Award-winning Peabody Trio. Currently, Mr. Usami is pursuing his Master of Music degree from the New England Conservatory under the instruction of Ayano Ninomiya, who has won numerous awards such as the Tibor Varga International Competition, Astral Artists Nation Auditions, Young Performers Career Advancement, and the Lili Boulanger awards. Mr. Usami is a devoted chamber musician, having performed at Weill Recital Hall, Metropolitan Museum of Art, Symphony Space, and Walters Art Museum. He has performed as concertmaster and leader under the baton of many conductors including Marin Alsop, Leon Fleisher, and Leonard Slatkin. Currently he performs with the Atlantic (MA), Charleston (SC), and Harrisburg (PA) Symphonies and is thrilled to join Symphony NH and work with terrific musicians. 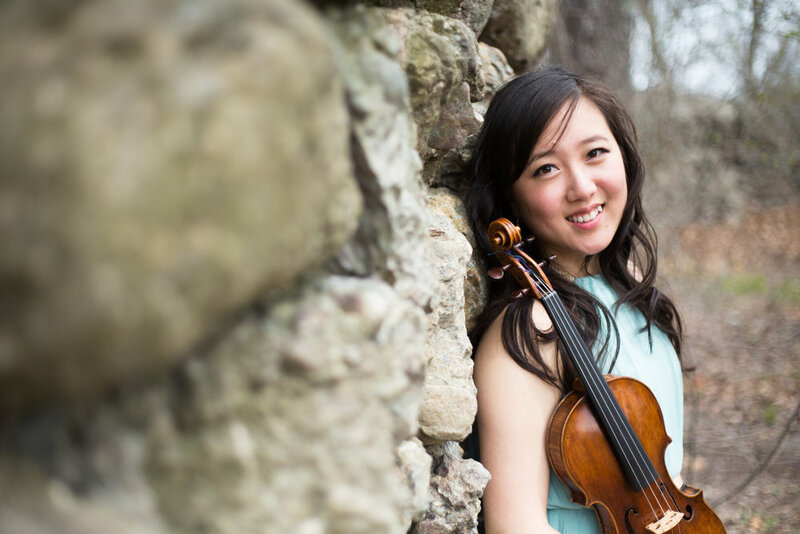 New section violinist Janny Joo is passionate about educating and coaching the next generation of musicians. She teaches violin and theory classes at Boston University where she is pursuing her Doctorate degree in Violin Performance. Ms. Joo received her Master of Music degree from Shepherd School of Music at Rice University and her Bachelor of Arts degree from the University of Nebraska-Lincoln with minors in Math and History. A multifaceted musician who is equally at home in chamber, orchestra, and solo recital settings, Ms. Joo has studied with members of the Chiara, Muir, and St. Lawrence String Quartet and also performed with artists such as Desmond Hoebig, who held chair as Principal Cellist with the Cleveland, Houston, and Cincinnati Symphony Orchestras, and Rhonda Rider, whose chamber music and solo recordings have been nominated for Grammy Awards. In addition to her involvement at Boston University, Ms. Joo serves as a fellow for the Music for Food organization, a musician-led initiative for local hunger relief, because she “[believes] that an artist is also a citizen who has a duty to further social justice.” The organization performs and promotes their mission around the Boston area. The work she does in the Boston community falls suit to Symphony NH’s mission to inspire and enlighten through exceptional live music. Serving as the concertmaster of Symphony Nova, Ms. Joo also plays professionally with the Phoenix and Boston Philharmonics and the Boston Ballet. In her free time, she enjoys ballroom dancing, horseback riding, traveling, and photography. Symphony NH is proud to welcome Mr. Usami and Ms. Joo to our orchestra. Hear them perform with Symhony NH during the 2017-18 season. To learn more about upcoming Symphony NH concerts visit www.symphonynh.org, sign up for our email list on the homepage, or call (603) 595-9156.